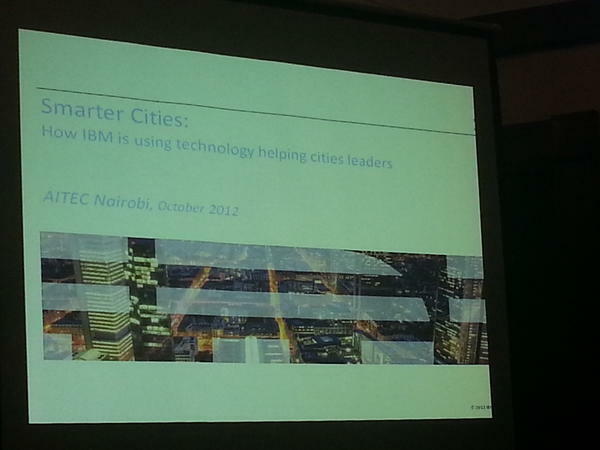 Gerard Nkusi, Central, East and West Africa Software Solutions Executive, IBM, Kenya presented Smart Cities: IBM Using Technology to Help City Leaders. The presentation cited the fact that a majority of the world’s population lives in urban areas. This has brought a growing demand on leaders to provide citizens with valuable and essential services. IBM Smart Cities aim in this is to interconnect the planning/management phases, people and the infrastructure required to meet the citizens’ demands. The initiative focuses on among others security agencies, businesses, developers, citizen groups and universities. With the help of Smart Cities solutions city leaders can make decisions with more insight from key data and statistics, this allows for better coordination of resources. Smart Cities technology have been made such that leaders can deploy them right away without the need to worry about the organization’s size and other barriers. Smart City Technologies have already been deployed in several areas around the world. The intelligent operations center has already been deployed in Rio de Janeiro (making rescue efforts more efficient), Miami dolphins entertainment center (the gates have been fitted with sensors which help in automatic crowd control), Miami-Dade parks (reduced water consumption). Other such technologies are the smart water management, deployed in the city of Dubuque and Iowa and smarter law enforcement used to profile criminals and crimes committed in the city making it easier for law enforcement to eliminate crime, this has already been deployed by several law enforcement organizations including the New York Police Department. Job Ndege from iWay Africa presented VSAT technology in broadband provision for smart cities and smart communities. By 2012, 20% of the African countries had at least one terrestrial cable. What then is the advantage of satellite over terrestrial links? As of now only satellite can achieve global connectivity as well as offer a diverse range of network applications. Some of the issues addressed by satellite links are remote conectivity, mobility and military networks. Can be used to expand cellular services. Most of the usage in Africa for IP or mobile broadband (2G, 3G, LTE), to extend this services, it is very easy to do so via satellite. Complementary services continuity (providing constant link to the internet). Satellites offer versatile, reliable and affordable links. Newer system that increase the capacity of satellite links include DVB-S2 ACM, better modulation, Ka-band and Ku-band satellites. With DVB, the prices can be reduced to be almost similar to those of fibre links. To reduce the latency of satellite links some measures have been applied such as the use of lower orbiting satellites. Mike Fiddes from Avanti Communications, UK presented The dynamics of Ka-band in Africa. Ka-band is new to Africa but it has been deployed in US and Latin America. Ka-band satellite has changed the availability of satellite space across the region. This will have the effect of reducing the cost of providing broadband internet through satellite. Ka-band uses very small antennas about 74 cm (Kenya and Tanzania). The cost of these antennas are 3rd of legacy satellite systems. According to Mike Fiddes, providers need to change expectations, such that they don’t only think about the cost of satellite services but their ability to open up markets. Use Ka-band for backup services in the cities. Can it compete with fibre services, prices will be same. Ka-band delivers the commercialization of satellite-based services. Amongst the benefits of Ka-band satellite are its ability to deliver broadband speeds and cost effective continuity services i.e providing backup systems. It can be put to work in different applications including government projects and hospital projects where bandwidth is expensive.